We have all chosen to homeschool because we felt like it was the best option for our family, especially our child with special needs. While there may be many reasons, I am sure that a big one for most of us is wanting our children to be able to learn in the way that is best for them. And for many of our children, the best way is by incorporating movement into learning. I have spoken about the DIR/Floortime method before (developmental levels, individual preferences and needs, and relationship based learning), but I wanted to stress the “I” and talk about individual preferences and needs and how we can use that to help incorporate movement and interests into learning. Everyone learns differently, but one thing is the same: we learn best when we involve our whole body and multiple senses. 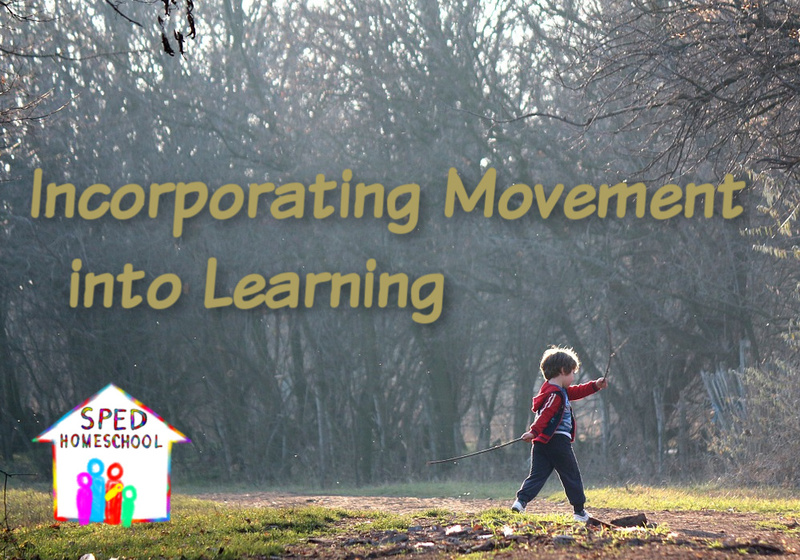 When I was working at a private school that used the DIR Method to teach children on the Autism Spectrum, we used movement as much as possible in the classroom. All of our students had different sensory needs, but two examples come to mind when I think about movement based learning. (Names have been changed). Cody loved to ride on a scooter. He had several at home and would bring one to school almost every day to play with when we went outside or to the gym. Since he loved to ride on it so much, we would use that passion as motivation when we taught him. He was working on simple addition, so when he would work on a problem and get the correct answer, he could ride his scooter around the gym that many times. Then we would move on to the next question and repeat. He stayed engaged with learning for much longer than just sitting, doing multiple problems at once this way. He also learned to concentrate on the problem because he knew he would get to ride his scooter as soon as he figured it out. Nick was another boy who loved movement, but he preferred to swing. We had a sensory swing in our classroom, often we would work on lessons while he was in the swing. One time I remember we had to do some testing with him, and that was becoming a struggle. When we tried the testing again, this time with him in the sensory swing, we were able to finish much faster than we anticipated. With my own son, I have found that the more ways we can use his body in learning, the happier he is. We have been working on the concepts of fractions lately, and using a play dough pizza set has really helped him a lot. Being able to touch and squish and get that sensory input while learning helped him to understand a concept much faster than he would have without that body involvement. Each child has a different sensory profile. Your child may love to spin in circles, while other children can’t stand to move that quickly. Some children love to watch lights move around, while others will close their eyes to block it out. Your child will seek certain sensory inputs while avoiding others. Knowing what these needs are for your child is crucial to their success. Along with the types of sensory they like or dislike, you have also probably noticed that your children have certain times of day or certain activities that require more sensory attention. The flexibility of homeschooling means that you can schedule learning during their sensory “down times” or times where they are most regulated. If running outside helps to calm them down, then do school right after outside time. If it tends to wind them up, then you should do school before physical activity. Make sure that they have the movement breaks they need at the times they need them. This will make your learning times go much smoother. Another great way to incorporate movement into learning is to use it with therapy. We obviously see movement worked into gross motor and occupational therapies, but you can also incorporate it into other areas as well. When I was working with a nonverbal 10 year old girl, we were trying to teach her to use PECS and she was struggling to pick up the concept. She liked to swing outside, so we spent a lot of time outside with “yes” pictures and “no” pictures. I would push her on the swing for a while, and then I would stop her. I would ask, “Do you want to swing?” and then hold up the two response pictures. She learned very quickly to pick the “yes” picture! Using her body and her favorite activity helped that concept to snap into place, and then we were able to use it other places as well. There was another boy who would have a full meltdown if someone didn’t finish a sentence or if he didn’t hear them finish it. Repeating the sentence or finishing it later wouldn’t stop the meltdown from happening. We used a calming swing that he really liked and once he was calm, we would play the “what if” game. I would say the first part of a sentence, and then ask him to guess what I was going to say. He would make a guess, and I would say, “That would work, what if I was going to say something else? What else could finish that sentence?” After a few weeks of playing this game when there was an incident, he learned to play it in the moment and guess what other people were going to say and then ask them what they were really talking about. Each family is different, so each homeschool is different, but you can see how paying attention to what your child’s body needs is an important part of their learning and regulation. 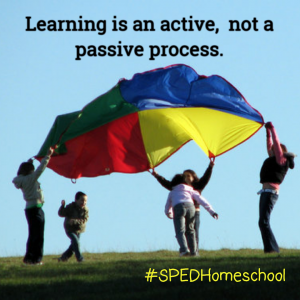 What are some of the ways that you already incorporate movement into learning in your homeschool? What do you think would be a great addition? In any ecosystem, it is important for all parts to be well balanced and have the things they require to thrive. When one part of the ecosystem is not getting what it needs, all parts suffer and have to compensate. Our families are no different. There is even an area of study that suggests the family can be studied like an ecosystem because it follows the same principles. The only way that a family can thrive is if all parts of it are receiving the things they need. Strong families grow like strong ecosystems, with each individual part contributing. Thinking of it simply, take The Lion King for example (cue “The Circle of Life” music). Mufasa explains to Simba how the antelope eat the grass, the lions eat the antelope, and when they die, the lions fertilize the soil (still seems like the antelopes drew the short stick, but it works). We see later when the hyenas are taking for granted all the bounty of their ecosystem that it leads to the land becoming barren. Their ecosystem suffered for a while, which means all parts of it suffered until everyone was getting what they needed. In the same way, a family suffers if everyone isn’t getting what is needed. So how do we grow strong families and support each member? Parents are the basis of our familial ecosystem. Since they are the foundation, a lot of the responsibility to make sure the ecosystem thrives falls on their shoulders. They are responsible to make sure that temporal needs are provided, children are loved and taught both academically and spiritually, and interactions between family members are either positive or resolved positively. Because of these responsibilities and the great love parents have for their children, other family members are usually put before themselves. This is necessary sometimes, but when it becomes the default setting, the family ecosystem starts to suffer. We as parents have needs that are important to our well-being. Taking care of our bodies, minds, and spirits are not luxuries that we may only indulge in when there is “extra” time (Ha!). Just as one part of an ecosystem can support another part until equilibrium is restored, we can only put off our own needs for so long before there is a collapse. We pour so much into our families that we need to take time to refill our own cups. Don’t fall into the trap of thinking that you can keep the family running smoothly without attending to your own needs. Strong families need strong parents. Children should each be considered as a separate and important part of the family ecosystem. While we sometimes group them together, they each have their own personalities and needs. Anyone with more than one child knows that the parenting style or guidance that works perfectly for one child, is not going to be as great of a fit for the others. We especially know for our children that our gifted learners, struggling learners, and neurotypical children all have different needs when it comes to education. That is why we all wanted to homeschool! While we may be familiar with these differences educationally, we should incorporate them into all aspects of our family life. Children need to recognize that while they are not the leader of the family, they can still contribute in meaningful ways by adding their strength and good example to the other members of the family. Differences in weaknesses and strengths among all family members should be recognized and embraced. That is why God put us together as a family! 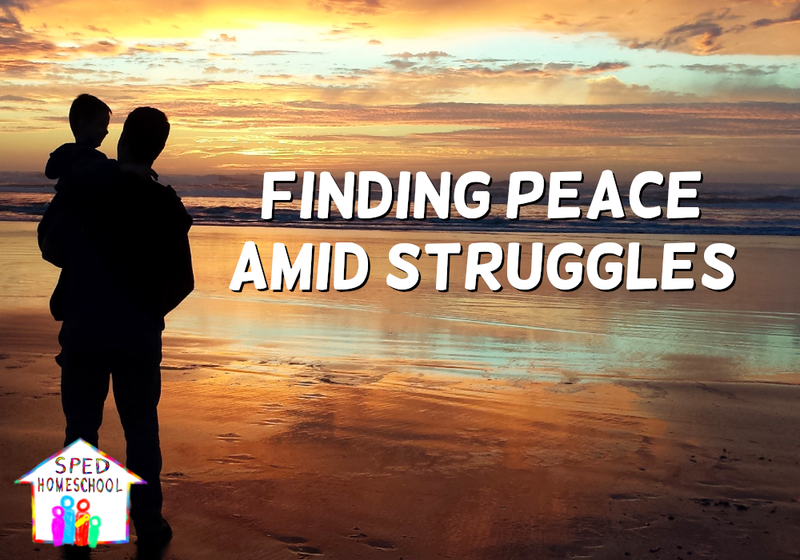 Weaknesses can be seen as opportunities for others to serve the people they love. Different strengths can be celebrated and added to one another to accomplish a much larger goal. And when we all take time to make sure that individual needs are met, our families can grow in love and strength as individual members and as a whole. 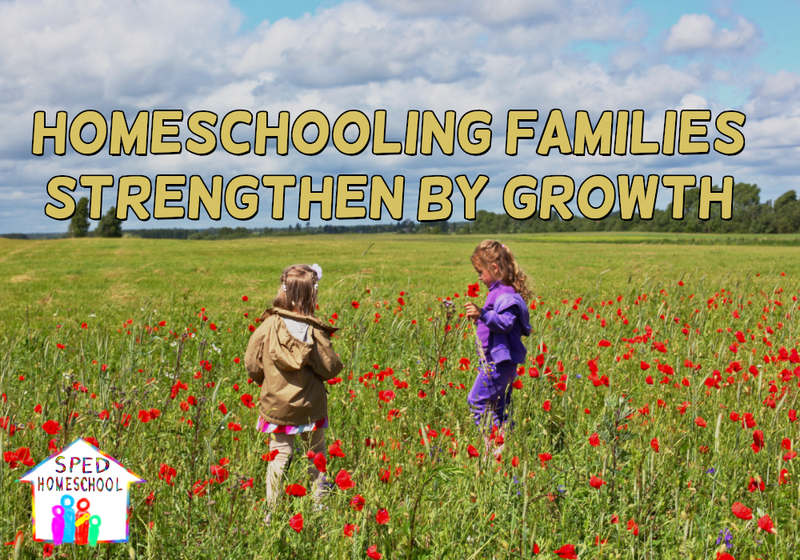 SPED Homeschool recognizes that special education homeschooling families need to grow at their own pace, but that they grow better when they can be supported within a larger community. This is why the new SPED Strong Tribes program we’re raising funds to start in 2019 will focus on helping families grow and thrive. To find out more about the SPED Strong Tribes program and how you can help us raise the funds we need to start creating local tribes that will strengthen families, check out our Fundrazr campaign. We are into all things nerdy in my house. This extends to superhero movies. And my boys are very into superheroes. They wear costumes more than regular clothes, and I have to address them by their character instead of their name or they don’t respond. Because of this, I have seen all the superhero movies. I am always taken by surprise though by how I can see parallels in my own life in these movies, and specifically what these movies show me about autism meltdowns. One of these instances was the latest Thor installment: Ragnarok. Thor gets stranded on a planet where he finds the Hulk. The problem is that once the Hulk changes back into Bruce Banner, he has a hard time staying that way. Since they are in hiding, they need him to not change back into the Hulk, or they won’t be able to escape. As I was watching, I was laughing thinking of how Thor’s method for helping Bruce Banner reminded me of living with a child with Autism. But once I thought about it some more, I realized that just as Thor’s behavior wasn’t really helping, sometimes mine doesn’t either. 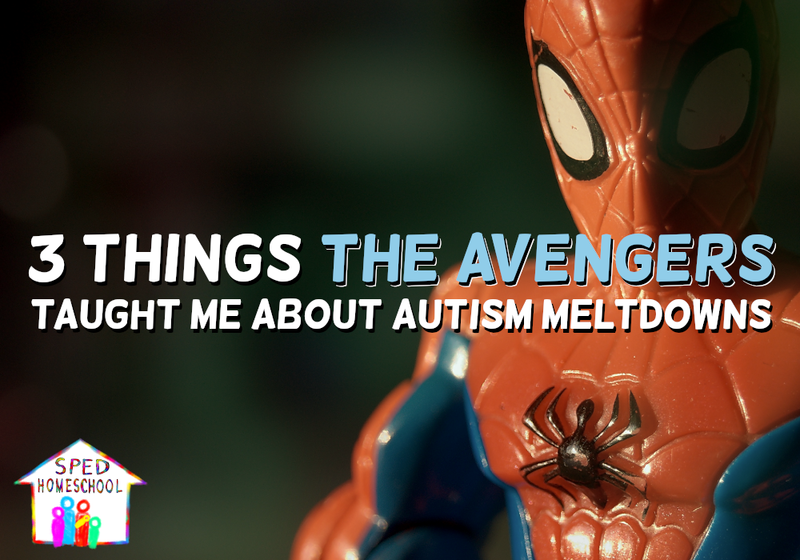 Here are some things we can all do a little bit better when it comes to dealing with autism meltdowns. In earlier Avengers movies, Black Widow and Bruce Banner form a relationship. Because of their relationship, she is able to help him change back into himself when he is the Hulk. She does this by speaking calmly, moving slowly, and letting him initiate touch first. She even has a phrase that she uses to signal to him that it is time to “transition.” Does that sound familiar? The important part of this interaction though is the trust that is built up between the two of them. She spent a lot of time making sure that he felt valued and safe with her, and it took time for them to find the routine that worked for them. She put in the time and effort to make it work. Thor on the other hand just jumps in and starts trying to imitate this routine without building up the relationship first. This means that he isn’t doing everything that Bruce Banner needs, but it also means that the trust isn’t there. They don’t have that solid foundational relationship to build from, so it doesn’t work, and Banner eventually just pushes him away and tells him to stop. Does that sound familiar too? How many times to do we just want to jump to the end results of being able to calm down our child without first building that foundation of trust and discovering what they as an individual need? I still do it after years and years of practice; it is an easy trap to fall into! Like I said, Black Widow uses calm and slow movements and speech in order to help Hulk calm down enough to turn back into Banner. Thor on the other hand keeps touching him, speaking quickly, and talking A LOT. It is obvious from his speech and his mannerisms that he is dealing with a lot of stress. The stress is the only thing that is being communicated, and that does not help calm anyone down. I think about how often my stress levels are high enough to leak into everything that I do. Then when trying to help a child with Autism either avoid a meltdown or come down from one, I only end up making it worse. I recently read “Fifteen Things They Forgot To Tell You About Autism” and in it the author talks about how when she is really worried about her children acting “normal” out in public, they usually have a meltdown; but when she just accepts that whatever happens will happen and she can help them if they do have struggles, then they usually do much better. I have also found this to be true with my son. Children with Autism are so sensitive to outside stimulus, that when we are anxious, that only makes a meltdown more likely. Another big thing that I noticed was the difference in motivations between Black Widow and Thor. Black Widow wants to help Banner become himself again because she loves him and cares about him. Thor wants Banner to stay himself because Thor needs Banner to help him. A lot of times I don’t want my son to melt because I am tired, or we are in public and I don’t want to be embarrassed or judged, or because I have something else I want to do. He can tell when I want to help him because I just want him to be safe and happy, and when I am trying to help him for selfish reasons. And that makes all the difference. Meltdowns are not fun for anyone (parent or child), but if we just employ these 3 subtle changes to the way we approach meltdowns, we will see a deeper relationship with our child and less meltdowns.